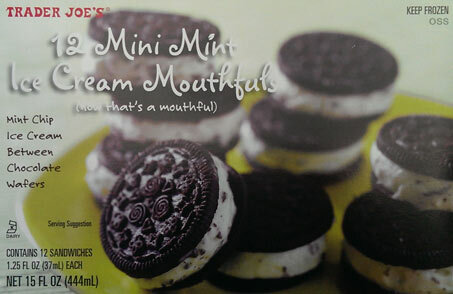 So every so often I check on the Trader Joe's fearless flyer and see what's new at the store. There's usually something that catches my eye but I'm terrible about actually getting over there at lunch time. I mean I haven't been there since October! Well, I headed over today, but instead of grabbing the new "Hold the Cone!" mini ice cream cones, I picked up this old treat that somehow I've never noticed before. 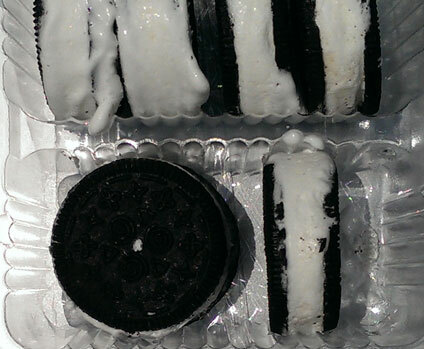 So ice cream sandwiches that are basically the size of Oreos? And about the same nutritional value as double stuff Oreos? Yes please! Whoa, it's the size I expected, but not the color. I expected a mild green (because of the green box) and way more chips. Like way way way more chips. No fear though. I love the cookie-like serving tray. You know I'm going to be having at least 4 of these to start (you know, because if I have just 2 or 3 then the last one will fall over, and we can't have that). How to eat the first one? Well, it says mouthful, so I shove the whole thing in and it's just the right size if you ask me, or at least close enough to it. It's not unexpected, but I am disappointed by the lack of crunch. There's no textural vibrancy to the wafers at all. I get it, the wafers absorbs moisture from the ice cream so it's cant really be crunchy, but still there's no wow factor there. The second one I attempt to bite in half, but there's a lot of squishing going on. It's possible, but I see why they recommend inhaling these things in one bite. The ice cream flavor is fairly mild, it's an easy going mint without a lot of tingle. It's also very soft [more so when it's been out a few minutes for picture time]. So I'm not in love, but I do love the fun factor here. Sometimes you get enough chips to add some nice thin crunching to the whole thing, but that doesn't happen nearly enough. The chips could have made up for a bit of the lackluster performance of the other ingredients. Now, I'm not saying these are bad, and if you are tempted, go for them, just don't assume they are perfect. Know that they are a fun treat and that you could very well inhale the entire package in one sitting... oh, come on, you know you were thinking about it. My advice would be to pop these open in front of one or two friends and just polish them off in one sitting. It'll be a nice $3.29 afternoon snack for the lot of you. On Second Scoop: Another four have been polished off and I'm still kind of just so-so on these. The ice cream is more solid now, but still soft, and the tiny chocolate chip morsels seem few and far between. Yeah, there's just something flat and lacking about these mini ice cream sandwiches. For a product that's been out for at least six years, I'd like to see more variety in the flavoring. These could easily be a seasonal product by changing the filling. Not everyone will like every flavor, but then at least I would have my favorite to look forward too. I'm not saying don't try these, but I'm saying don't get too excited just in case. We buy these from time to time. I like the size of them. I can bite them easily, even when fully frozen without any toothfreeze problems like some other thicker products can cause. I like mint chocolate chip as a flavor, the cookie is good and the ability to portion control is also a nice plus. I've never really wanted any other flavors. You went to Trader Joe's and decided to get this over their new cookie butter ice cream? Rookie move, Dubba. @cybele: I'm spoiled, I want more flavors! @Anon: me, a rookie? dont think so. More like they didn't have it yet! Taste's like toothpaste, not like mint chocolate chip. The ice cream is a weird consistency, there are almost no chips, they are dead white, and the cookie tastes like cardboard. I am returning them.